Classic Mini Talk Interested in the Classic Mini? Discuss the Classic and its variants here! well at least the replica!!! 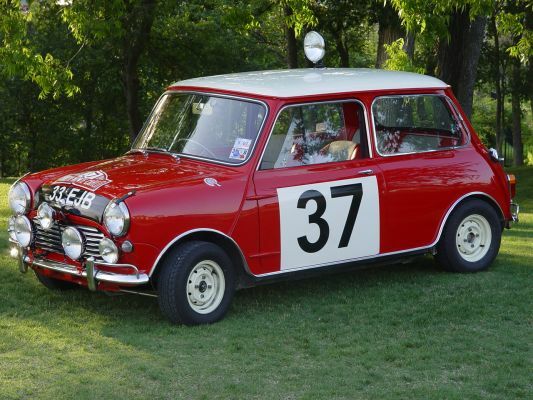 INTO THIS ... the 1964 Monte Carlo Rally Winner! Robert is so modest. Here's a thread with all kinds of neat pictures showing progress. Gives you a better idea of what he really did. What a project! Congrats! One car I REALLY want to see some day! that is so incredibley sweet! Congrats and she looks just perfect!!! Where did u get specs on the orig? just photos or did you go see it? That looks like a fantastic job done. What's with the radar dish on the roof? The "radar" is a light. The original had one just like it. An old Rally thing. It's talked about in that thread I pointed at. It's looks much better in person. Ok, ok, i'm here now. 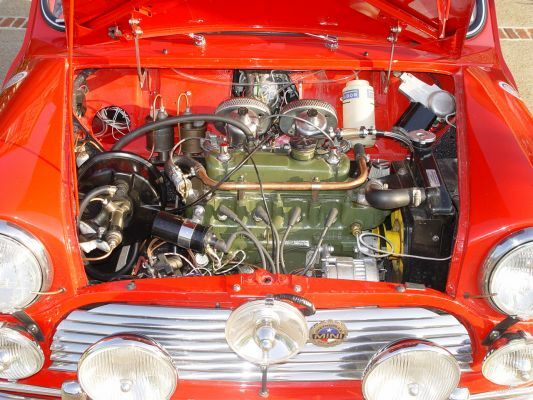 The specs came from tons of photographs from the Heritage Museum in England as well as from a book entitled Works Minis by Browning. The whole process took basically a year to complete. As dwjj pointed out, the roof mounted rally spot was very instrumental in these early rallies. Rallies back in the 1960s ran 24 hours a day sometimes totaling 4 days straight. The roof mounted spot helped find landmarks at night following the route instructions on the rally. 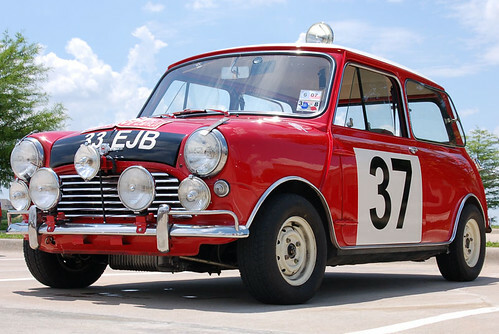 These rally minis also had spot lights on the boot to illuminate behind. 33EJB had 7 rally lights not including the headlights! The car really lights up at night! OK-I have to ask. With all those lights, what's the current draw, and how many watts can the alternator supply? Did the rally version have a special alternator? Wow, I can't believe it took a whole year. I'd love to read about your restoration in print. L1LABRAT would be the best person to answer this question since he built the car! Will? I can, however, answer your last question! The rally versions used generators. I'm not a big fan of generators, and wanted to use an alternator for more reliability and draw during RoadRallies and everyday driving in today's traffic. I keep hearing stories about LUCAS and the "Prince of Darkness"! 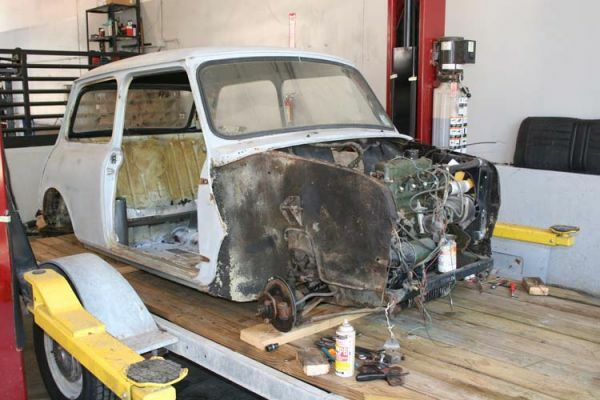 I figured the use of an alternator would keep "the Prince of Darkness" from surfacing in the rally Mini. However, the alternator purchased is made by LUCAS! So far everything associated with the electrical is working GREAT! You can see the alternator on the lower right side of the engin compartment. Last edited by primeMINIster; 05-20-2007 at 08:21 PM. Let's not talk twin carbs. Check out MC2 issue #9! Congrats Robert!!!! Congratulations to both Robert and Will!! While the replica is a pretty one the first glance to the trained eye it shows it is a replica. 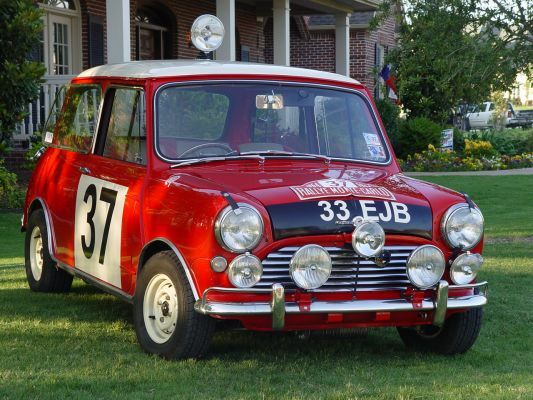 I am not a Mini fan though I have owned a few in my time, however yesterday in a gathering there was a talk of minis and 33 EJB came up in the conversation and I was surfing and came across this website and this entry and thought to make an input. Would you buy a wrapped MINI?